FORT BLISS, Texas: soldiers assigned to 1st Special Forces Group (Airborne), Joint Base Lewis-McChord, Washington, participated in the inaugural Army Warfighting Assessment (AWA 17.1), a soldier-led assessment held in the rigorous and realistic operational training environment found here and at White Sands Missile Range, New Mexico from Oct. 17-28. The 1st SFG (A) Commander, Col. Will Beaurpere, described several key training objectives his unit looks to achieve during AWA 17.1. Beaurpere was particularly interested in the opportunity to train with simulated forces on the battlefield. AWA 17.1 also features joint and multinational participation as 5,000 military personnel from every component of the U.S. Army including National Guard and Reserve Soldiers with select elements from the Air Force, and Marine Corps, in addition to numerous multinational partners, assessed equipment and capabilities designed to modernize today’s joint and combined force. During AWA 17.1, 1st SFG (A) trained on conventional and unconventional warfare tactics in ways that can’t be recreated in other simulated training environments. 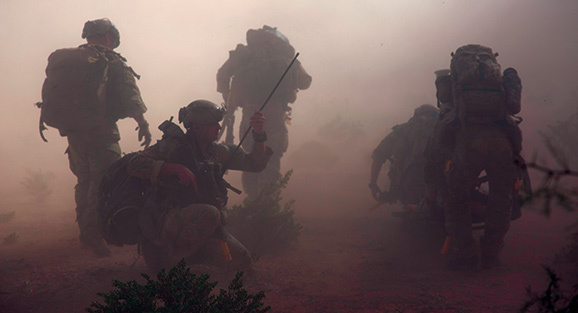 With an area of responsibility aligned with U.S. Pacific Command, 1st SFG (A)’s ability to integrate seamlessly with multinational forces is critical to its mission. Interoperability isn’t the only training objective SOF achieves during combined operations with multinational partners.